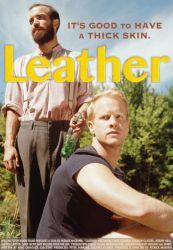 Leather is a unique film and has a story with heart. But it starts to take you somewhere and then leaves you hanging. What the heck ever happened to the rabbit? My synopsis: Andy and his father had a rough relationship so Andy hasn’t been to see him in the Catskills in many years. He now lives in New York City with his boyfriend Kyle. Birch, Andy’s childhood friend, has meanwhile bonded with Andy’s father, lived with him, learned from him, and nursed him on his death bed. When Andy finds out that his father has passed he takes Kyle out to his childhood home to take care of affairs. When they arrive they unexpectedly find Birch there. Andy then grieves his lost relationship with his father who he still seems to despise, while Kyle and Andy’s relationship seems to be struggling. Andy also tries to reconcile his hate for his father with Birch’s closeness to him leading their relationship down a unique path. Birch is somewhat of an enigma in that he is so undefined. He is old-world in practice, yet modern in some behavior. He is calm and cool, yet angry at interruption. He is understanding and kind, yet judgmental at times. Kyle is just.. I don’t really know. Kyle is like an undeveloped subplot that annoyed the heck out of me. A cartoon upfuck I think is how Andy referred to him. Themes here range the gamut, and there are so many that I feel like many were underdeveloped. I could feel like the movie was trying to tell me something, but I never got the entire message. For instance, one thing that struck me was a conversation that pointed out the differences between modern life and Birch’s “pioneer life.” Andy talked about having to be medicated because his life is so stressful. Then they end up spending the night in the woods. But I’m not sure what this is trying to say exactly. Another example is when Andy confronts Birch about whether he is gay or not. Birch seems to exist without labels. This is certainly a topic that exists in the LGBT community, and many debate about the virtue of giving oneself a pigeon hole label that defines us in black and white terms. Humanity is so much more gray. But we have Birch who seemed to have a thing with Stacy in the beginning, then acting like a couple with Andy, but then writing a love letter to Stacy again. So are we saying that this lack of labels is bad because this seems like it will hurt Andy in the end? It doesn’t matter? I’m not really sure. I feel like there were too many aspects of the story that ended in ellipses. I don’t know that any of the drama had resolution except that Kyle stood up for himself in the end and went home. Maybe that’s the point – that much of life’s drama has no real resolution, and that labels are pointless because human behavior is so bizarre. I give the filmmakers credit for several things. One is their tenacity is getting this movie made. Production was halted in 2011 due to a devastating storm in Prattsville, NY. They could have walked away, but they made the film the next summer. They also used film! I know, what is that? It gave the film a unique look and feel that added to the context of the story. And the story had character. The problem for me was that the story didn’t involve enough development. Too many unresolved issues made it confusing and jarring at times. The script and delivery also kept me from focusing on the message of the film as I tried to reconcile how the characters were behaving with what the film was saying. Too many strange outbursts made some scenes awkward to watch. (Kyle’s Anakin Skywalker scream really was unpleasant). Once I was into the film (about 40 minutes in) I felt like it had a chance to go somewhere. And in some sense I felt like it did. But in others I felt like it lacked cohesiveness and the punch to drive its message home. Check out the movie website here and the trailer here.